3. What are risk factors of rosacea? 4. What are rosacea symptoms? 6. How to treat rosacea? Rosacea is a common skin disorder worldwide, which leaves behind discomfort feelings and special damages on the skin. Despite there is no cure for this disease, we can use several natural remedies and essential oils for rosacea to reduce its symptoms. This article may help you with useful information about this annoying condition. Rosacea (Roe-say-she-uh) is a pathologic skin condition, characterized by redness in your face. The redness can locate in several parts but mostly assembles beyond the nose and cheeks. Sometimes, the chin, forehead, and ears are affected. These signs last for weeks or months before diminishing. People usually mistake rosacea with acne, allergy and other skin disorders . Rosacea is very common worldwide, but middle-aged women that own light skin is more likely to have rosacea. This chronic disease affects over 16 million Americans every year. People with rosacea often experience the flare-ups in a circle. This condition means that the signs and symptoms of rosacea last for a particular period, then disappear before returning. The rosacea treatment is not available at this time, but there are many ways to control and reduce the symptoms of this disease. The cause of rosacea is still unclear. But many scientists suggest that genetic and environmental agents contribute to the appearance of rosacea. If you have a family history of rosacea or your relatives are suffering this disease, you are at risk of developing this skin condition either. Although there is still a lack of evidence, a diet contains excessive spices is likely to make rosacea symptoms more severe. Those foods affect the balance of skin physiology and increase the sebum, thus cause acne and other skin problems. Likewise, these unhealthy lifestyles result in bad skin condition. They are one of the major risk factors of rosacea. H pylori is a common bug that lives in our body. Although H pylori are available in ordinary people, it seems that it is more popular in those who have rosacea. However, whether it takes responsibility for rosacea is still unclear. Demodex is a part of microorganism that lives in the oil glands of the human skin. Although these mites occur in everybody, they likely appear with a large number of people with rosacea. Demodex mites carry Bacillus oleronius (a singular of Bacteria) that stimulate the inflammatory reaction. This situation might play a potential role in the cause of rosacea. The present of Cathelicidin concentration is higher in rosacea people. Whenever a pathogen appears and causes damage to our body, Cathelicidin is activated. They attract white blood cells and create an inflammation response, result in pustules and visible blood vessels. This skin condition is associated with rosacea . Using low-quality cosmetics and non-prescribed skin productions may cause skin irritation. Particularly in people with high risk of rosacea, any skin allergy can develop the symptoms of this disease, or stimulate rosacea appearance. What are risk factors of rosacea? Have a medical history of severe acne, cysts or nodules. It is essential to be aware of those risk factors above to have an early diagnose and proper control. However, people of all races, genders, and ages should not be passed out. Facial redness is a primary symptom. The central area of your face (nose and upper cheeks) is the dominant position of redness. Sometimes, small blood vessels become visible and swollen, creates spider veins. Your skin may be sensitive to any touch or light, usually, leaves behind burning and irritated sensation. Along with a dry and rough skin surface, you are more likely to flush and blush than other people. This subtype is characterized by acne-like breakouts on the previous red skin. The acne-like breakouts flare up in a circle, with means they come over a period of several weeks before diminishing. Spider veins are also available in this rosacea subtype. The skin condition remains similar to subtype one, except for oily surface. Sometimes plaques appear on the skin in patches of a thick, red, and scaly area. The rate of rosacea subtype three is quite small. Patients in this group often suffer signs and symptoms of another rosacea subtype previously. It leads to a thick and bumpy skin texture, especially the nose area. This condition is called rhinophyma. Other facial parts including chin, forehead, and cheeks could be affected either. Combined with oily skin, pores become larger, create a potential place for blackhead acne. Whatever symptoms develop, your vision is not good as before, and you may need to consult an ophthalmologist. Along with natural remedies, essential oil for rosacea treatment should not be passed out. Similar to other methods, they help reduce the severity of rosacea and control symptoms. For anyone who does not know where to buy essential oil for rosacea, Young Living is one of the most well-known brands that can serve the highest-quality products. There are many kinds of essential oils, but in this article, we introduce 6 ones that are most effective and easy to find. Here are the best essential oils for rosacea you should know. There are two types of Chamomile species that are used in medicine and cosmetic industry: German and Roman Chamomile. People collect the flower head and produce this essential oil through steam distillation in extremely high temperature. German Chamomile essential oil is famous worldwide as it provides moisture for a dry and rough skin. Moreover, due to the impacts of antiseptic and antifungal agents, it penetrates through the skin surface and calms the irritated or inflammatory condition. For rosacea, this essential oil helps reduce the redness and itching sensation caused by inflammation. Mix the liquid thoroughly and pour into a spray bottle. Your natural skin mist is ready to use. Spray on your face several times per day, especially when you are out in the sun or working with computer for quite long. There is nothing more to say about this classic and wonderful essential oil. 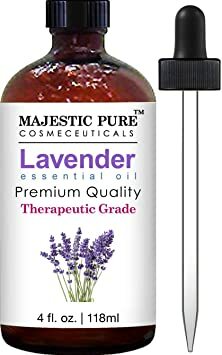 For centuries, Lavender oil has become a fundamental ingredient in many beauty products, as well as aroma therapy. It is one of the greatest essential oil that could be applied directly to the skin without dilution. With the help of Lavender oil, rosacea redness and inflamed skin symptoms will reduce significantly. Among essential oils for rosacea, Lavender oil should be your first consideration. There are many ways to use this essential oil and here is one of the recipes for rosacea cooling toner. Mix all ingredients in a bowl, pour into a spray bottle and shake slightly. You can spray the mist in your face 1-2 times per day after skin hygiene. 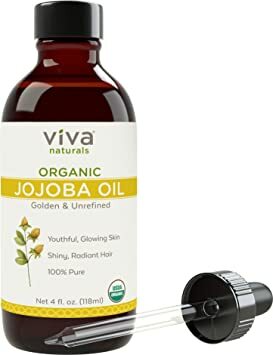 This essential oil is extracted from the seeds of jojoba plant in America. It is one of the most popular natural skin-care products, as you can find it in most health food store. The structure of jojoba oil is similar to “sebum” – a secretion from sebaceous glands in our skin. It is a perfect choice for skin moisturizer because it will not block pores even when you own a dry skin in rosacea. Germany scientists also proved the beneficial effect of clay mask with Jojoba oil in reducing skin lesions . Mix the liquid together and store in a jar. You can apply this mixture on the irritated skin up to three times per day to minimize the redness and soreness. It comes from the leaves of Melaleuca Alternifolia species in eastern Australia. Nowadays, many famous brands of natural cosmetics put tea tree oil ingredient in their skin care products to solve lots of skin ailments. 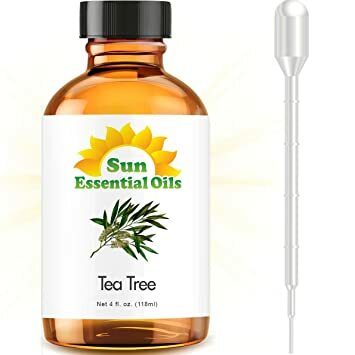 Tea tree oil owns the incredible anti-inflammatory and antiseptic properties – which are the primary uses of this essential oil . How to use tea tree oil for rosacea? There are several options to use skin products that contain tea tree oil, such as lotion, cream, mist, or mask. However, you must use it topically as the oral intake is not recommended. If your skin is sensitive, you should dilute tea tree oil with purified water before applying on the skin, because it may cause allergy. 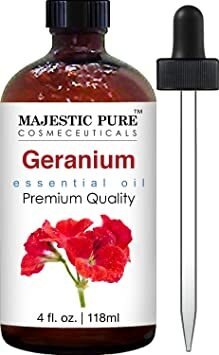 Since the Egyptians used Geranium oil for lots of beauty purposes, we have brought it into the medical and cosmetic industry to treat acne, skin inflammation and rash. Geranium oil stimulates the wound healing process in many skin disorders, such as rosacea, shingles, dermatitis, and eczema. Therefore, it should be considered as one of the greatest essential oils for facial redness in rosacea. Pour the mixture into a bottle, or put it in your daily face wash. Then use it several times per day until your skin problems disappear. It is better to test a small amount of Geranium oil on the surface area under your arm before using to make sure there is no irritation. Until now, there are more than 1,500 studies approved the benefits of coconut oil in various aspects. The excellent effect of this essential oil does not stop in the food industry, but its vital role in the cosmetic field is undeniable. Using coconut oil for rosacea is the ultimate choice: it is friendly with your skin structure, thus causes no irritation or allergy. While keeping skin moisture, coconut oil still accelerates wound healing and reduces inflammation. Step 1: Take an adequate amount of coconut oil and warm it in your hand. Step 2: Massage the oil gently on your face in a circular direction for one minute. Pay attention to the nose and eye area. Step 3: Use a wet makeup pad to remove the excess oil, but do not rub your skin. Step 4: Admire your clean and moisturized skin after finishing the process. You will know that you have rosacea after a doctor or a dermatologist perform a physical examination. Unfortunately, there is no cure for rosacea until now though scientists are trying their best to bring up proper treatment. But you can control and reduce the symptoms by changing some daily habits, balancing your diet, and choosing suitable skin-care products. We will discuss these natural methods in “Natural remedies for rosacea” part below. In case your doctor indicates any medications to control the symptoms, please note that these drugs don’t cure rosacea. This skin disease is linked to an inflammatory condition but isn’t caused by any particular types of virus or bacteria. So, antibiotics are the most proper rosacea treatment prescribed to reduce the severity of the disease. Antibiotics are available in oral tablets, and topical cream combines with an active ingredient called azelaic acid. We have talked about the dominant role of Cathelicidin in rosacea causes: high level of this protein is associated with the severity of the disease. That is why some antagonist medications which stop the Cathelicidin production is beneficial in controlling the symptoms. It is predicted that Cathelicidin will be potential dermatologic interventions in the future. As rosacea is an incurable disease, any natural method that avoids the risk factors of rosacea is really helpful for its prevention and treatment. The important key is to boost your immune system against harmful agents and prevent the symptoms flaring up. It is not quite hard to follow some tips below to maintain the best health status. It is essential to notice how your body reacts to the foods and drinks in your daily diets and stay away from triggers. According to experts, rosacea should be considered as a body disorder than a skin problem itself. Your inner health is somehow reflected through the condition of the skin. In rosacea patients, the skin is quite sensitive to any external elements, results in redness and acne. Pay attention to the response of your skin after eating, especially spicy and strong-flavor foods. If there are any abnormal signs, stop eating immediately and consider moving that kind of food out of your list. Increase healthy foods intake is the best way to wipe out rosacea at its root. If possible, choose organic, fresh and suitable foods that contain necessary elements for your immune system. Here are some natural remedies for rosacea. Organic vegetables and fruits. The anti-inflammatory, antioxidant compounds, vitamins, and minerals in these fresh foods help nourish the skin deeply inside. Choosing green leafy vegetables and yellow/orange fruits means that you are absorbing a great source of vitamin C – the best natural protecting agent. Healthy fats. This type of fat is available in coconut oil, olive oil, nuts, and seeds. Scientists also recommend using this alternative fat instead of trans-fatty-acids. Plus, they are beneficial for your digestive tract, as they keep you full for longer without indigestion. High-quality proteins. Almost people got used to the traditional source of proteins from poultry and cattle. But they do not know that the ultimate choice for protein intake comes from the legume, salmon, cage-free eggs, and grass-fed animal. Anti-inflammatory herbs. To reduce skin irritation in rosacea, it is worth trying some herbs that contain anti-inflammatory compounds, such as garlic, turmeric, onion, and green tea. You can eat them instantly, or add to your dishes like a tasty ingredient. Some of them are available in capsule form and could be used as the dietary supplements. Ultraviolet radiant can cause terrible damage to the skin structure, which aggravates rosacea symptoms. According to Korean scientists, the sun exposure is one of the major risk factors of rosacea . Therefore, remember to wear sunscreen every time you get out, even in cloudy weather, to protect your sensitive skin from harmful UV light. However, it is essential to choose high-quality and appropriate sunscreen products, because some are toxic and can make your symptoms worse. Besides using essential oils for rosacea, you should add moisturizer in your list of skin-care cosmetics to reach the best result. A moisturized and hydrated skin can protect ourselves from environmental agents. But due to the wrong awareness of skin hygiene, many people overuse cleanser to clear their face results in a dry, rough, and patchy skin surface. This condition increases the severity of rosacea symptoms and stimulates flaring-up cycle. 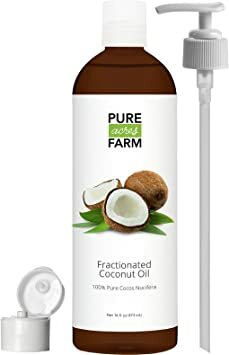 If you own an oily skin, apply a natural moisturizer that fits with your skin types, such as coconut oil or aloe vera. Natural products contain less irritated compounds, which are safer for you with a reasonable price. In case you want to cover redness and bumps by makeup products, just be careful. Instead of using commercial ones that can aggravate your rosacea symptoms, consider moving to other organic and natural makeup products. The less chemical you put on, the better result you will get. Many people have been suffering from mental and emotional problems since rosacea symptoms adversely affected their quality of life. In oppose, these negative feelings make the symptoms of rosacea flare-up, which creates a disorder cycle. Only when stress is solved, the skin condition is under control. There are several ways to manage and reduce the stress levels, such as talking to a psychometric, doing exercises, healing prayer, or journaling. Always keep your mind open to everything and everyone, eliminate any internal factors and be honest about your condition. Who knows what changes that will come toward you. To conclude, there are several parts of your face are affected by rosacea symptoms. But this is more than a skin problem as rosacea reduce the patient’s quality of life. In many survey reports, patients with rosacea suffer problems in their social relationships, at work, and even in their marriage . The most common feeling is frustration and embarrassment. According to the National Rosacea Society, over 90 percent of patients reported of less self-confidence and self-esteem. Among severe cases, 88 percent said that this problem worsened their professional interactions, and 51 percent even lost their job . Additional, the long-running skin condition that flares up unexpectedly can cause anxiety and depression. Unless there are suitable prevention and treatment, rosacea will adversely affect the patient’s quality of life. Rosacea is a chronic skin disorder and incurable, but changing lifestyle habits and using natural remedies can reduce the rosacea symptoms. After reading this article, you have known some best essential oils for rosacea prevention and treatment, as well as useful recipes. Hope that this information is useful and fully provide what you are searching for. We will be happy to recieve your feedbacks and also your LIKE and SHARE. It will be a great motivation for us to share more tips in the future.